As presidential candidates sling dirt at each other, America desperately needs a few real heroes. Tragically, liberal historians and educators have virtually erased traditional American heroes from history. According to the Left, the Founding Fathers were not noble architects of America, but selfish demagogues. And self–made entrepreneurs like Rockefeller were robber–barons and corporate polluters. Instead of honoring great men from America’s past, kids today now idolize rock stars, pro athletes and Hollywood celebrities. 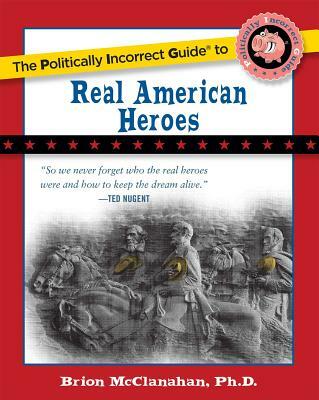 In his new book, The Politically Incorrect Guide™ to Real American Heroes, author Brion McClanahan rescues the legendary deeds of the greatest Americans and shows why we ought to venerate heroes like Captain John Smith, adventurer Daniel Boone, General Robert E. Lee and many more. The Politically Incorrect Guide™ to Real American Heroes not only resuscitates America’s forgotten heroes, but sheds light on the Left’s most cherished figures, including Franklin Delano Roosevelt and the Kennedys. Brion McClanahan is author of The Politically Incorrect Guide(TM) to the Founding Fathers, The Founding Fathers Guide to the Constitution, and holds an M.A. and Ph.D. in American history from the University of South Carolina. Born in Virginia, he received a B.A. in history from Salisbury University in Maryland. He lives with his wife and children near Phenix City, Alabama, just across the river from Columbus, Georgia.